In a Dutch oven or heavy stock pot, heat the oil over low heat. Add the onions, and cook until translucent. Then, stir in the garlic, and cook until lightly golden, but not burned. Toss in half of the chopped basil (2 tablespoons), plus the cayenne, and stir for 30 seconds. Add the tomatoes and 6 cups of water. Raise the heat to high, and bring to the boil; then, reduce heat to simmer and cook, uncovered, for 20 minutes. When the tomatoes are fully cooked, add the goat cheese, and stir to combine. Remove the pot from the heat, and add the remaining 2 tablespoons of basil. Puree with an immersion blender (or let cool slightly, then puree in batches in a stand blender). 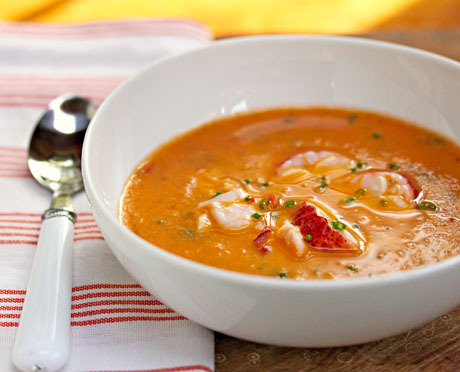 Serve the soup warm, garnishing each individual bowl with sliced lobster, sliced basil, and a sprinkling of fresh chives.